Water, Titanium Dioxide, Mineral Oil, Talc, Propylene Glycol, TEA-Isostearate, Isostearic Acid, Glyceryl Stearate, PEG-100 Stearate, Isopropyl Lanolate, Micro-crystalline Cellulose, Cellulose Gum, Algin, Magnesium Aluminum Silicate, TEA-Stearate, Methylparaben, Propylparaben, Butylparaben May contain: Mica, Bismuth Oxychloride, Iron Oxides, Ultramarines. Full coverage Spf 15 Last forever Not available in a shade that matches my skin tone. Only 4 shades Covers like a dream. Can be used as a concealer and a foundation and I do use it as both. Goes on smooth doesn't leave a shine. Full coverage without being heavy and thick. The tube last me 8 months with daily use 5 times a week. Full Coverage, Get a lot for the price, 15 SPF, coverage is amazing. This will cover just about anything A little thick, you need to thin it out so you can spread it easily. Doesn't come in a very wide range of shades. I bought this makeup after starting accutane because all my other makeup made my skin look dry and a dead looking shade. I tried about 6 different full coverage foundations and this is the one I settled with. The coverage is a true full coverage there is no gross smell to the product which I noticed with the others. This is non pore clogging and has spf 15 in it! I just love this stuff. The one downfall of this is it only comes in 4 shades and the lightest shade is still too dark on my skin. I don't consider myself pale either.. 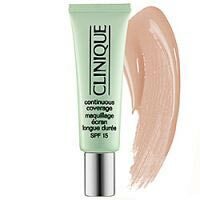 I mix this with a very pale foundation which lightens it up and thins it out to make it workable because it is a thick foundation. It is all worth it to me though to get a great full coverage makeup without needing to build coverage.